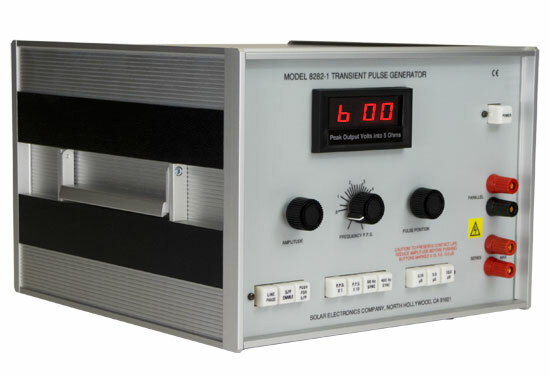 The Solar Model 8282-1 Transient Pulse Generator was designed for screen room use in making conducted spike susceptibility tests. It provides all the waveshapes required by MIL-STD-461B/C and many other military EMI specifications. The generator will meet the testing requirements of NEMA TS 2-2003, Version 02.06, sections 2.1.6.1 and 2.1.7. The Model 8282-1 is not suitable for RTCA/DO-160G Section 17 (see Solar Model 7054-2) or MIL-STD-461F CS106 (see Solar Model 2854-2). 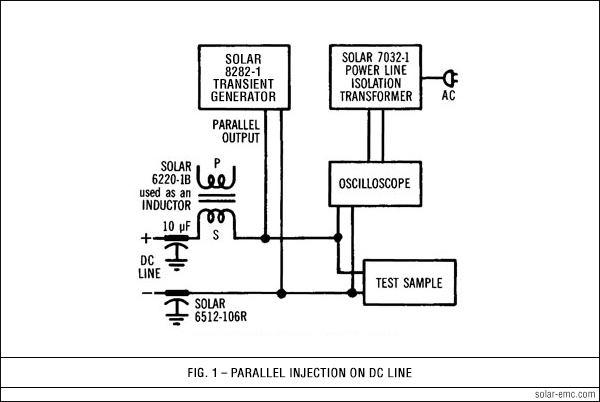 Spike generators required for susceptibility testing have been our specialty since 1962, when our first unit, the Solar Model 6254-1, was introduced. The Model 8282-1 incorporates all the flexibility and technical excellence of the previous models and provides features required by specification MIL-STD-461B/C. Three different spike durations are provided: 0.15 µS, 5.0 µS, and 10.0 µS. The pulse shape approximates the curve of Figure 1 in MIL-STD- 462. The amplitude of the spike voltage is fully adjustable and is displayed on a digital meter. The repetition rate of the spike can be adjusted with a panel control to any rate from 0.5 to 50 pulse per second. A single pulse can be injected with the aid of a panel-mounted pushbutton. All functions are selected by pushbuttons which are lighted when activated. The Solar Model 8282-1 Transient Pulse Generator provides up to 600 V peak amplitude for each of the 0.15, 5.0 and 10.0 µS spikes. The output voltage rises steeply to peak amplitude as adjusted by the panel control, then falls exponentially to cross through zero at the duration of 0.15, 5.0, or 10.0 µS as selected by pushbuttons. The voltage falls below zero and "rings" for a period determined by the inductance in the output circuit or the load. With series injection on 50, 60 or 400 Hz power lines, the spike can be applied to either the positive or negative half cycle of the power frequency sine wave. The spike can be adjusted to fall on the power sine wave from 0º to 360º . For non-synchronous injection, the repetition rate can be adjusted from 0.5 to 50 p.p.s. A pushbutton enables the "single spike" feature and the spike can be manually triggered by pushing another button. A connector on the rear panel makes provision for remote triggering of the single spike feature. Two methods of remote triggering are provided. One method requires the application of 24 V DC to trigger the pulse at rates determined by an external switch up to 50 pulse per second. The second method requires the application of a square wave which can be used to trigger the spike up to 50 pulse per second for the 0.15 µS spike and up to 1000 pulse per second for the 5.0 and 10.0 µS spikes. This latter feature can be used to trigger the spike in sync with some function within the equipment under test. • Provides outputs up to 600 V peak amplitude for the 0.15, 5.0 and 10.0 µS spikes into a 5 Ω resistive load (low source impedance). • A wide range of repetition rates allows spike injection in terms of the pulse rates of items being tested. • The single pulse feature enables controlled isolation of transient effects. • Adjustable pulse position on AC power lines relates the transient susceptibility to the real time aspects of digital circuitry served by AC power. • Transients can be injected in synchronism with repetitive circuit functions as required by Method CS06 of MIL-STD-462. • Remote triggering of single or repetitive pulses in terms of particular system characteristics. • The upper terminals of the PARALLEL pair and the SERIES pair provide a positive-going spike on the 5 µS and the 10 µS modes. These terminals deliver a negative-going spike in the 0.15 µS mode. 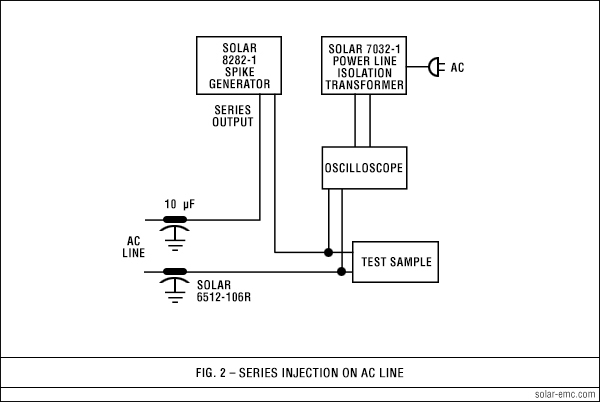 When the test plan requires both a positive and a negative spike, it is necessary to reverse the connections to the output terminals of the Solar Model 8282-1 Transient Pulse Generator. Plugs into SERIES output terminals to provide transient levels up to 15 kV, peak, into Type 7510-1 Spark Gap assembly for static discharge tests. Plugs into SERIES output terminals. Handles up to 150 A through the secondary for high current test samples.